As I sipped a café con leche and watched kids on their way home from school, office workers on break, and teenagers joking with friends passing by, the last thing I expected was an avant-garde theater group to start performing in front of me. The theme was the hypocrisy of modern society…I think. There were costumes. Juggling. Audience participation. People would stop and watch for a minute, then hustle across the avenue to a three-story shopping mall with attached multiplex theater. This is Manizales, a city in Colombia’s Eje Cafetero, the Coffee Triangle. This region is the birthplace of Juan Valdez, a corporate mascot that was based on the coffee farmers of this highlands region in the foothills of the Andes. Three thriving cities act as lynchpins in this lush, mountainous region where coffee plantations cover steep hillsides and the countryside is dotted with colonial villages. They are about 30 minutes by air (or five-hour bus ride) from the better-known expat hotspot of Medellin. In each you can have a sophisticated lifestyle for much less than you’d pay in North America. Besides street theater, I found independent cinemas, jazz nights, craft beer bars, and purebred miniature poodles wearing little sweaters; not what I expected in coffee country. There were upscale restaurants offering Argentinian, French, or other international cuisine with not much above $10 on the menu (Local restaurants will run you $2 to $3 a plate). Browsing the shelves of well-stocked supermarkets, I discovered you can fill your fridge with groceries for the week (including plenty of imported items—I found cheese from Wisconsin and everything you need to make sushi at home, for example) for about $50. All in all, a couple can live well under $2,000 a month. You can also get a top-notch medical care at a fraction of U.S. prices; you’ll pay $30 to $80 per month to join the public health insurance program. Perhaps the biggest attraction is the amazing weather. The temperatures don’t vary much throughout the year, 70s F during the day and 60s F at night—just cool enough to put on a sweater for a dinner and a blanket on the bed for comfortable sleeping. No heat or AC needed. That keeps electric bills low, about $40 per month. And these cities aren’t so large as to be unmanageable. You can get around easily by cheap taxi and bus, your own two feet, or, in the case of Manizales…cable car. It’s a university town with lively shopping, dining, and nightlife most of which is concentrated on the east end of town, with the epicenter around the El Cable park and plaza. It’s a go-to meeting spot and landmark. To the south, about 15 minute’s walk past the soccer stadium and sports complex, is Palermo, a trendy neighborhood where you can get a three-bedroom condo for just $100,899. Like most condos, the balconies here offer views of the rest of the city splashed out into the valley below. In many of these units you’ll also find features like fine finishes in the kitchen and bathrooms. And the buildings often have a doorman on duty 24 hours a day. Another three-bedroom condo is listed for $57,176. It’s in the Milan neighborhood, which is known for a tree-shaded avenue of sidewalk cafés and restaurants. Pereira is another university town about an hour drive from Manizales along a well-maintained toll road and one of the region’s principal cities. When I was scouting there I found a three-bedroom home in a gated community, featuring swimming pool and gym, for $57,174. Homes like this are relatively rare because condos are more common but becoming increasingly available. In the popular Dos Quebradas district is a three-bedroom condo for $45,404. Even in one of the highest end neighborhoods in town, Pinares, which is near the big shopping mall, international restaurants, gourmet groceries, and more, you can get a three-bedroom condo for $84,402. It is a hilly area so a vigorous walk or quick taxi ride will get you everywhere. Armenia is the smallest of the cities that make up the “corners” of the Coffee Triangle. But it offers most of the same amenities. A local contact of mine here, a teacher at an international school, has his eyes on some condos being built right now. One-bedroom units, new construction, in the desirable north end of town are going for around $30,000. You’ll find similar condo towers going up in Pereira and Manizales for about the same price as well. A studio apartment, resale, is currently listed at $21,861. A four-bedroom condo, near the showcase Park of Life, a shopping mall, a craft beer bar, and more, is listed at $94,172. The neighborhoods to buy in in these “second cities” are geared towards upwardly mobile local residents, as well as retirees and others who’ve fled the higher prices of the country’s largest metro areas, like the capital, Bogota. So you don’t get that “bump” in prices you might find in well-known expat havens. By getting in before the mainstream you can take advantage and pick up a resale or new construction condo in one of the best neighborhoods in town for a fraction of what it would cost in Medellin. 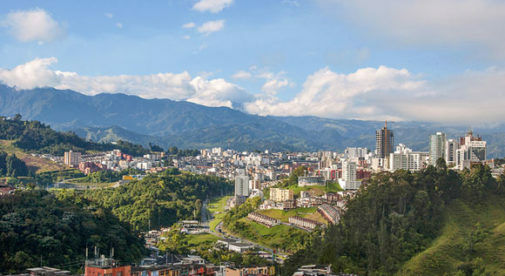 As more expats, not to mention well to do and middle-class Colombians, discover the calmer yet still sophisticated cities of the Coffee Triangle, prices will rise. A growing tourism sector could be a factor there as well. When I returned home I gave serious thought to moving to Colombia. And I’d choose one of the cities of the Coffee Triangle over Medellín. There’s a palpable energy, a feeling of opportunity in real estate and business. But, at the same time, these cities feel manageable, Of course, the ability to get world-class coffee straight from the source is appealing as well.